← Woman Sees 6 to 8 Balloon Like Objects Hovering Over the Ocean. Man Finds 3 Strange Marks on Ankle After Sleep Paralysis Episode. PHOTO OF STRANGE MARKS ON ANKLE THAT OCCURRED AFTER SLEEP PARALYSIS EPISODE. paranoid but I’m starting to think something is happening. I have attached an image of my ankle. More Information Sent by Witness: I believe I first noticed the marks some time in June or July of last year 2015. I thought I had got bitten by fleas and was profusely scratching my ankle. No I don’t recall anything unusual, but I do remember arguing with my significant other the night before and I decided to sleep in my living room instead of my master bedroom. I do recall having sleep paralysis that early morning though while laying on my couch. It is right besides a large sliding glass door to the balcony. I live right across the way and I’m overlooking the double tree hotel out in the Balcony area and can’t imagine being pulled through my balcony or through ceiling walls as there are neighbors that live above me. There are people out there during odd hours through the morning coming and going from the valet area. I had just moved into the metro area some time in Mid May. When I was living in Irvine, it was more secluded having an enormous hill facing west of my complex. I used to live right next door to the Verizon amphitheater in Irvine, CA. While swimming late one night I have seen 2 Unidentified Lights hovering in the night skies and later ascending straight up. This entry was posted in Abduction, Simple or without memory, Body Marks, Emotional effects, Photos, Physical effects, UFO Sightings 2015, UFO sightings California, Xfiles. Bookmark the permalink. 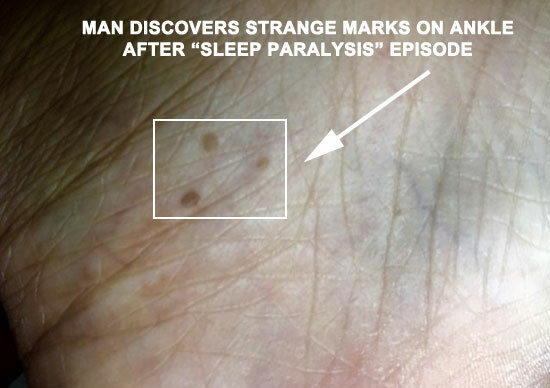 7 Responses to Man Finds 3 Strange Marks on Ankle After Sleep Paralysis Episode. Where does this hypnosis crap come from anyway? When did we start attacking one pseudoscience with another? Who said anything about hypnosis? Open up your mind! He could find out under hypnosis. I sense this might of happened when he was asleep. He could be a test subject to them. Anything is possible and should be ruled out. What’s the point in your response, Jack L. Metcalfe? This man obviously has had something happen given his statements, and perhaps the marks look like moles to you, but what are you basing it on? A hunch? This site is to explore things that are happening to people that other sites and people decline to acknowledge. Well, Rebecca, the point is to try and determine which is most likely. Did an alien civilization travel across some unknown distance of our Milky Way galaxy, locate this lone individual and subject him to an examination or procedure that left three small marks on his ankle or, does he have three moles on his ankle that he just now noticed, because it itched? I’ll go with the second possibility.